The 6ft 3in shot stopper signs after playing as a trialist against Dundee United. Hibernian have secured the signing of Hull City goalkeeper Mark Oxley on a six month loan. The 23-year-old has joined Alan Stubbs at Easter Road after playing as a trialist against Dundee United on Sunday. 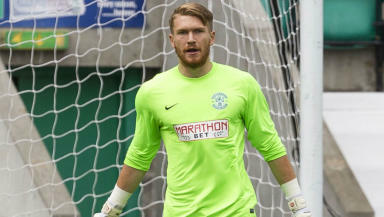 The signature of Oxley secured the Hibs boss his senior goalkeeper after Ben Williams and Sean Murdoch both left the club in May. Speaking to the official Hibs website after signing on Monday, Oxley said he was excited about the season ahead. 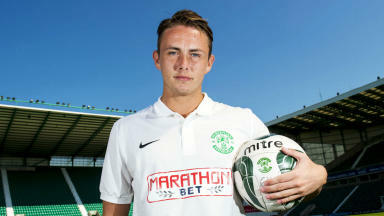 He said: "As soon as I spoke to the manager, I quickly realised that Hibs are a club going in the right direction and I wanted to be a part of it. "This is a great opportunity for me and I'm determined to seize my chance by helping Hibernian to win as many games as possible and to get the club back into the Scottish Premiership." Stubbs said that Oxley's friendly inclusion was "full of optimism" and thanked supporters for their patience while the deal was completed. The head coach told the official Hibs website: "This move suits everybody - we were looking for a new first choice goalkeeper and Mark was looking for a fresh challenge and an opportunity to play regular first team football. "Everybody was aware that filling this position was a priority and, after thoroughly scouring the transfer market, Mark was the stand-out choice and his arrival here is another positive step in the right direction." Hibs will also continue to monitor 22-year-old midfielder Michael Richardson, who played as a trialist in the match. Richardson was released by Newcastle United this summer after spending loan spells with Leyton Oriet, Gillingham and Accrington Stanley.